We are responsible for the quality of the product. If you have any questions before or after purchase, our customer service is always ready for you. ★Features -- Plug and play; Environmentally friendly ABS plastics; Scientific ergonomic design; 2.4 GHz wireless technology receiver, avoiding interference; Powered by 1 x AAA battery (not Included). ★Focus on the Key Area -- A bright red light laser pointer that's easy to see against most backgrounds, highlight the key area of your slides. 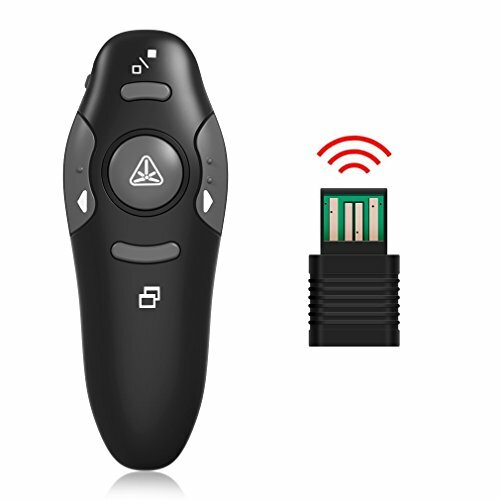 ★Ultra Long Distance Remote Control -- Wireless remote control distance range of up to 33-foot(10 meters), you are free to move around the room and interact with your audience. ★Buttons -- Light pointer, display of black screen, next, previous, full screen, on/off switch; One-touch keys easy to control slideshow; Keep pressing the button to keep the light on. ★Support Options -- Supports MS Word, Excel, PowerPoint, ACD See, website, iWork (Keynote & Numbers & Pages) etc; For MacBook on OS, plug the usb receiver into laptop, it will come out a box, and then you can select 101 or 104 option. If you have any questions about this product by YINXN, contact us by completing and submitting the form below. If you are looking for a specif part number, please include it with your message.